Don Siegel's classic exercise in psychological science fiction has often been interpreted as a cautionary fable about the blacklisting hysteria of the McCarthy era. It can be read as a political metaphor or enjoyed as a fine low-budget suspense movie, and it works well either way. Kevin McCarthy stars as Miles Bennel, a doctor in the small California community of Santa Mira, where several patients begin reporting that their loved ones don't seem to be themselves lately. They look the same but seem cold, emotionally distant, and somehow unfamiliar. The longer Miles looks into these reports, the more stock he places in them, and in time he makes a shocking discovery: aliens from another world are taking over Santa Mira, one citizen at a time. Emissaries from a distant planet have sent massive seed pods containing creatures that can assume the exact physical likeness of anyone they choose. When Santa Mirans go to sleep, the pod creatures take on the shape of their victims and then destroy their bodies. The aliens may look the same, but they possess no human emotions and, like plants, are concerned only with propagating themselves and eventually subsuming the earth. Needless to say, Miles and his friends are terrified, but since it's hard to tell who's a person and who's a pod, they're at a loss for what to do, especially when it seems that there are increasingly more aliens than humans. 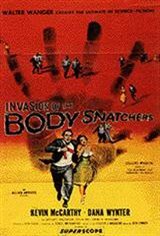 Invasion of the Body Snatchers builds tension slowly and steadily, dealing not in the shock of bug-eyed monsters common to other 1950s science-fiction movies but in the unnerving possibility that the enemy is among us -- and impossible to tell from our allies. The ultra-paranoid conclusion of Siegel's original cut was softened by Allied Artists, who added a framing device that suggested help was on the way. This coda was as effective in blunting the film's grim conclusion as giving a Band-Aid to a beheading victim; few films of the era make it more painfully clear that for these people (and maybe for ourselves), there's no turning back and no way home. Keep an eye peeled for a bit part by soon-to-be-legendary Western director Sam Peckinpah, who plays a meter reader and also (uncredited) helped write the screenplay. Based on a novel by Jack Finney, Invasion of the Body Snatchers was remade in 1978 by Philip Kaufman and in 1993 by Abel Ferrara (as Body Snatchers); and its influence can be felt from The Stepford Wives (1975) to The X-Files.